I have always wanted to try making ice cream, but I don’t have an ice cream maker (and try not to buy unitasking gadgets). Summer brings a slew of amazing sounding ice cream recipes which, for the most part, just depress me into trying to justify making an ice cream maker (can I make dinner ice cream?). 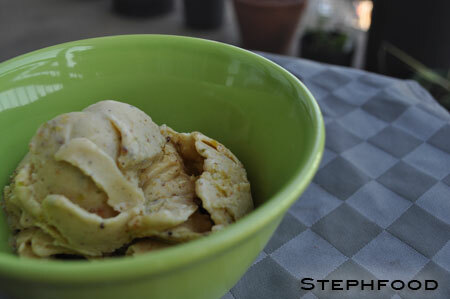 Then I came across a recipe for Almond Pista Kulfi, posted by indosungod on Daily Musings. 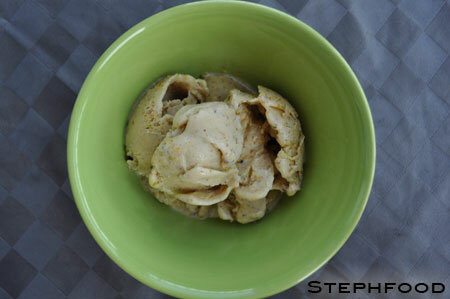 Kulfi is an Indian frozen dessert that is made with milk, instead of cream, so doesn’t require an ice cream maker. They often come in flavours like mango, almond, pistachio – and can contain ground nuts. This recipe is a combination of almond and pistachio. Vanilla Beans with Ground Almonds and Pistachios. I first had to roast my almonds and pistachios, and then grind them coarsely in the food processor. Since I had some on hand – and totally love them – I decided to add vanilla bean, as well as a few drops of almond extract. You start by cooking down some whole milk and condensed milk on the stove, adding in a few ingredients and cooking it down a little more. Here is where I ran into some trouble. Never having made kulfi before, I wasn’t sure how thick it should be. Initially, I followed the instructions, cooking the milk down for a certain amount of time. After adding in some ingredients and letting it thicken, you’re supposed to cook it down a little bit further. I did take it off earlier than it called for, thinking it was thick enough… but it was actually too thick. It was actually too sticky to freeze all the way through! The next day, I decided I would try to fix things. I warmed up a little more of the whole milk and stirred it into the “semifreddo” concoction, crossed my fingers and stuck it back in the freezer. It worked!! Writing instructions for these kinds of things can be tricky, because different stoves and cookware can cook things differently. Trial and error are definitely required! I now have a better idea of the consistency it should be when done. I know this sounds gross when talking about dessert, but it had the consistency of clam chowder (sans lumps) before freezing. Thick, coats the spoon, but not too sticky. Back off! This bowl is MINE! Sooo delicious! Once I’m done killing this batch, I’m going to make a cardamom coffee one!!! Can’t wait!! Based on this recipe from Daily Musings. In a heavy-bottomed pan, combine the condensed milk and whole milk and bring to a boil. Reduce the heat to below medium and let it simmer for 30 minutes. About 10-15 minutes in, mix in the seeds scraped from the vanilla bean, then add the bean pods. Pull the vanilla pods out. Mix in the almond extract. Mix the custard powder in cold milk, whisk to combine and add it to the boiling milk, stirring as you are adding it. 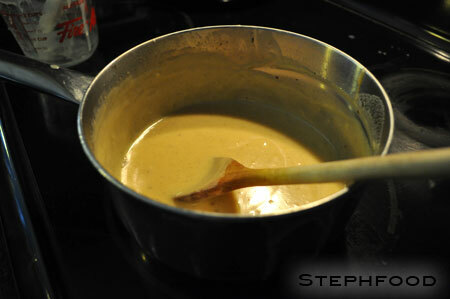 The mixture should be thick enough to coat the spoon, but not sticky and gloopy. Continue to cook for up to 10 minutes if required. Turn off the heat and let it cool to room temperature. Stir occasionally to prevent film from forming on the surface. 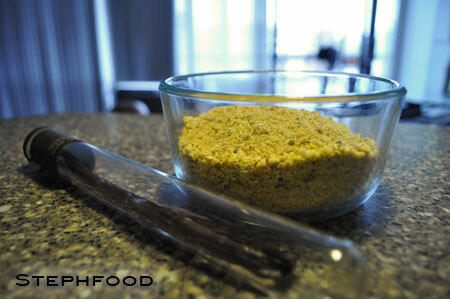 Using a food processor or mortar & pestle, grind the nuts to a coarse meal texture. Be careful not to grind them to a powder! Add them to the milk mixture once it had cooled. Freeze the mixture for 8 hours or more. Thanks very much for participating in my event- this is just a delightful kulfi!